Healthy Dog Foods: Do You Know What’s In Your Dog’s Food? Making sure that your beloved pet eats healthy dog foods is not as easy as it sounds. For example, dogs in the wild consume plants and animals as part of their diets. Therefore, your dog’s digestive system is certainly designed to handle raw meats. 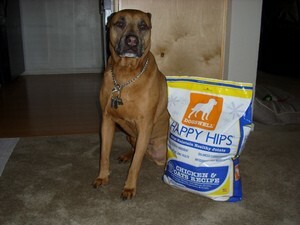 However, most commercial dog foods and dog treats are made primarily of grains and refined protein sources. Since the meat source is removed from commercial dog foods, that means your dog is eating mainly wheat, barley, rice, corn, and oats. That said, there are a lot of dogs that have food allergies. And when a dog is allergic to his food it’s usually because of wheat, corn, soy and barley. Yep, those are the primary ingredients found in most commercial dog foods. So, if you want to feed only healthy dog foods to your pet, be sure to look at the labels. If you’re looking for better quality healthy dog foods, then visit specialty pet stores which concentrate on providing higher quality dog foods than supermarkets or pet store chains do. Or, if you’re unsure about the BARF Diet, then you may simply want to start feeding your dog a cooked homemade diet. Here are the differences between raw food vs cooked homemade food for dogs. Finally, if you simply want to supplement your dog’s regular kibble with healthy human foods, then check out these human foods that are also healthy food choices for dogs!